The device measures subtle electrooculography (EOG) muscle changes by means of a small 5 megapixel camera over the eye which records your eyelid movements digitally frame by frame via your associated computer device. [Michael] has been working on projects involving lucid dreaming for a long time. The recurring problem with most projects of this nature, though, is that they often rely on some sort of headgear or other wearable which can be cumbersome to actually sleep with. He seems to have made some headway on that problem by replacing some of the offending equipment with a small camera that can detect eye movements just as well as other methods. The idea behind projects like this is that a piece of hardware detects when the user is in REM sleep, and activates some cue which alerts the sleeper to the fact that they’re dreaming (without waking them up). Then, the sleeper can take control of the dream. The new device uses a small camera that dangles in front of an eye, which is close enough to monitor the eye’s movement. It measures the amount of change between each frame, logs the movements throughout the night and plays audio tracks or triggers other hardware when eye movements are detected. [Michael] is looking for volunteers to provide sleep logs and run tests, so if you’re interested then check out the project! 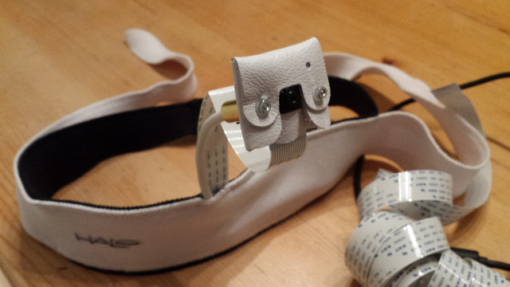 Added support for the halovision headband (Halograph EOG). The one we have all been waiting for. A headband with a NoIR camera that measures the amount of change between each frame from the video stream. Non-invasive, light-weight and as comfortable as it gets.